Suited to Geelong families looking to have the day they bring their baby into the world artfully documented. Planning consultations on the phone, via email and in person. On call service from 38 weeks of pregnancy. My attendance from the time you enter active labour and until after your babe safely arrives. 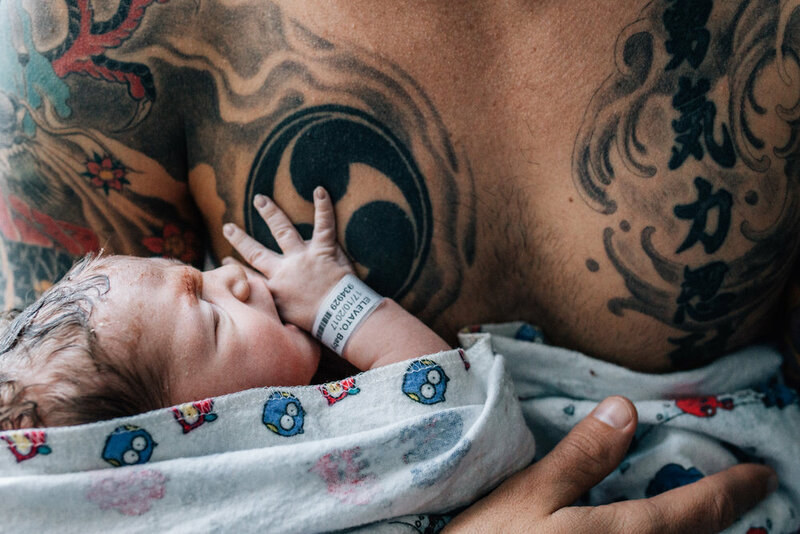 Honest and artful documentation of your baby's birth, and the first hours spent with your new baby. A custom USB containing the full resolution digital negative collection, documenting every detail of your little one's birth day. Get in touch to hear more about having your birth story documented - let’s meet for a coffee! Oh, and I don’t mean to brag but… Okay, yes I do. ; ) How great to be awarded this ^ little baby?! Having the birth of my little girl documented by Michelle will go down as one of the best decisions I’ve ever made. From the very first time I stumbled across her work, I fell in love with Michelle’s aesthetic. Her ability to capture the most mundane of moments in the most magical light is a skill not many possess. On the evening of my birth Michelle was a calm and quiet presence. Not only was she there to capture every significant minute of my labour and birth, she was a soothing partner in my journey. “My family and I had the pleasure of having Michelle photograph my labour and delivery, as well as newborn images when my daughter was 10 days old. Michelle was incredible from the moment of initial contact all the way through to receiving our images. I was looking for a photographer who creates beautiful, natural images and was able to provide a package to meet my needs, and Michelle did exactly that. Michelle went above and beyond to stay in contact during the lead up to my daughters birth, and arrived at the hospital swiftly with her camera and a smile on her face. Michelle blended in perfectly during my labour, she was as attentive as needed, and respectful of the vulnerable position you are in, in that time. Michelle was able to capture beautiful images without myself, my partner or the staff realising she was in the room! I will never forget that Michelle went above and beyond her role and became a support person for me when my partner had to focus on our new baby, as I was experiencing some complications. At the in home newborn photography session I was hesitant as to how I would feel attempting to act natural in front of the camera, but Michelle made this such a breeze, she has a personality that will make your whole family feel comfortable from the moment of your first meeting. Michelle has created some truely incredible memories my family will have forever. I am always going back and looking through her incredible images and am still in awe of the attention to detail and the rawness her eye is able to capture. View a beautiful birth story in its entirety here and here. Shared with permission. Book your Birth Story Now.